A wooden grain elevator in Ste. Rose du Lac, on the CNR Ste Rose Subdivision in what is now the Municipality of Ste. 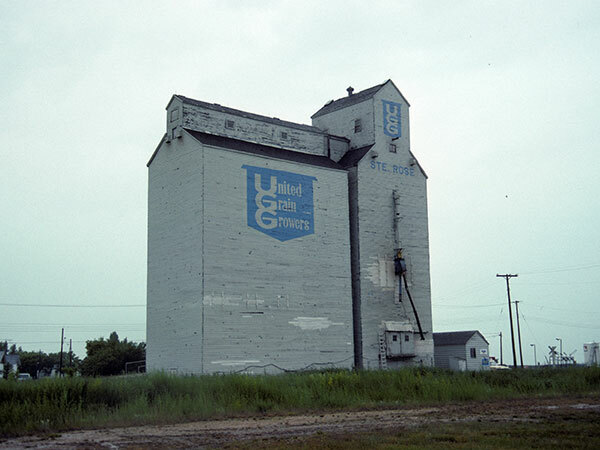 Rose, was operated by United Grain Growers. The No. 1 elevator was destroyed by fire on 22 September 1962. At that time, the No. 2 elevator became No. 1. Closed in the 1990s, the building was later demolished. The site is now occupied by a seniors residence. Source: Historic Resources Branch, Grain Elevator Inventory, slide 2037.